Major Russian banks Sberbank and Bank of Moscow are to allocate $17 million to create a bike rental network in Moscow along the lines of similar initiatives in London and New York. However, the system will face the same problems as in the Big Apple: a lack of bike lanes and heavy traffic. 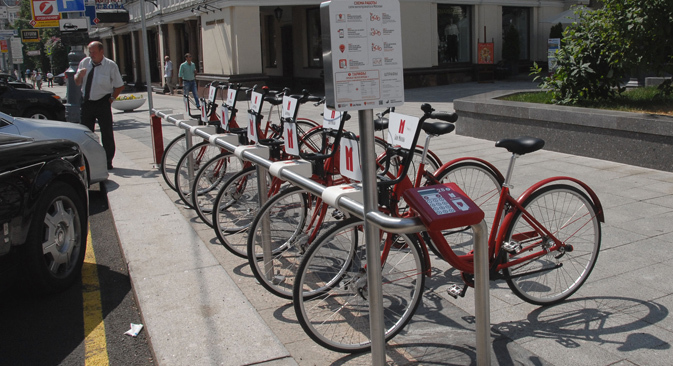 In late May 2014, the Moscow mayor's office announced a tender for setting up a groundbreaking bike rental system in the city. Planned along the lines of similar networks already in existence in other large cities such as London and New York, the system will allow Muscovites to pick up bikes from stations situated around the city and use them for a small fee. When they have finished using the bikes, they can return them to the nearest station. The contract for the bike rental system consists of two parts. The first covers costs for setting up a rental infrastructure: The starting price of the contract is 450 million rubles ($3 million). In addition, 600 million rubles ($17 million) more will be required to purchase 4,500 bikes and set up 300 rental stations. These funds will be allocated by major Russian banks, Sberbank and Bank of Moscow. The banks will not be receiving any profit from this, but each bike will carry their logos, making the project part of the banks' advertising strategy. "This scheme was tried by Citibank in New York City, which launched its Citi Bike bicycle rental in the bank's corporate colors,” says managing director of ZIP Realty investment company Yevgeny Skomorovsky. [In fact similar networks have been in existence for several years - Barclays Bank in the UK launched a bike rental program back in July 2010, for example - and the New York project (began May 2013) is almost certainly itself a copy - Editor’s note] “In 2013, Bank of Moscow copied the idea and launched an identical project in Moscow, even calling it Citybike too. The project has turned out to be a success and now Sberbank has joined in." Indeed, the first bike rental project was launched in Moscow on June 1, 2013, when the mayor's office invited Muscovites to abandon their cars for the sake of bikes in order to reduce traffic jams. Funding for the pilot project, 100 million rubles ($2.8 million), was allocated by Bank of Moscow. The bikes were supplied by the Czech company Homeport, and the rental chain was operated by a Bank of Moscow subsidiary called City Bike. Over a period of 12 months, according to the city authorities, some 46,500 people rented a bike, making a total of 66,500 journeys, so the city has decided to expand the project. As a result, Moscow will become Europe's third largest city in terms of the number of rental bicycles (4,500), after Paris (14,000) and London (8,000). Interestingly, the current operator of the bike rental system, City Bank, will take part in the new tender. The bicycles to be rented to Muscovites as part of the bike share scheme will be quite heavy (21 kg) and will be fitted with a terminal with a keyboard. Currently, payment can be made only via a terminal at a bike station, whereas with the new bikes, it can be done just by touching a card to the terminal on the handle or by entering a pin number received online. A two-hour ride will cost 120 rubles ($3.5), while a 30-minute ride will be free. According to experts, the main obstacles facing bike rental in Moscow are the same as in New York City: a lack of bicycle lanes and heavy traffic. For example, the need to set up bike lanes in Moscow was first discussed only this year. "We have started building bicycle lanes when refurbishing main motorways," Moscow mayor Sergei Sobyanin told journalists in May 2014. It is for this reason, according to Maxim Volkov, an expert with UFS IC, that the prospects of creating a thriving bike rental system in Moscow are rather vague and unclear. "The main reason is the lack of bicycle lanes or, indeed, any bike-related infrastructure. Our big cities, including Moscow, are not used to this type of transport. Besides, the idea itself is further complicated by the weather factor," Volkov explains. In Moscow, bicycles can be used for just half a year, from late spring to early fall, with the rest of the year ruled out by freezing temperatures and snow on the roads. Having said that, according to FINAM investment company analyst Anna Mishutina, the city's transport infrastructure development program envisages the construction of up to 73 km of bicycle lanes by the end of 2016. "On the one hand, the lack of infrastructure is impeding development,” says the head of the Institute of Transport Economy and Transport Policy under the Higher School of Economics, Mikhail Blinkin. “On the other, Moscow is not the safest place to drive. Sidewalks are packed with pedestrians, while the sides of the roads are full of parked cars. Thus, there is simply no space left for bicycles." This, he adds, gives grounds to skeptics to doubt the success of the bike rental project. Yet, as Blinkin points out, “in the city center and for distances of 5-8 km, the bike is the fastest means of transport."